﻿ Sassuolo 0-3 Juventus. A comfortable win, at last! 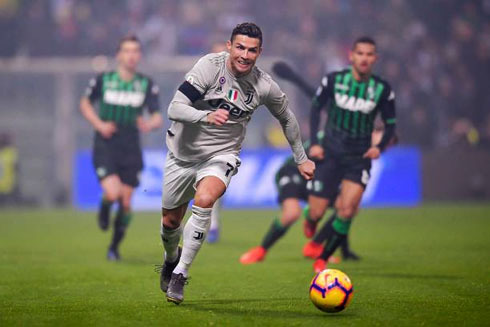 10.02.2019 » Sassuolo 0-3 Juventus. A comfortable win, at last! Juventus didn't slip in their trip to Reggio Emilia this Sunday evening and beat Sassuolo by 3-0. Cristiano Ronaldo scored the Italian champions second goal and played an active role in the other two goals of the night. Juventus earned another win in their Serie A campaign this season, after beating Sassuolo by 3 goals without response and moving 11 points clear of Napoli, who dropped points this Saturday against Fiorentina. Tonight, the Vecchia Signora managed to keep a clean sheet following 3 consecutive games where they struggled at the back. 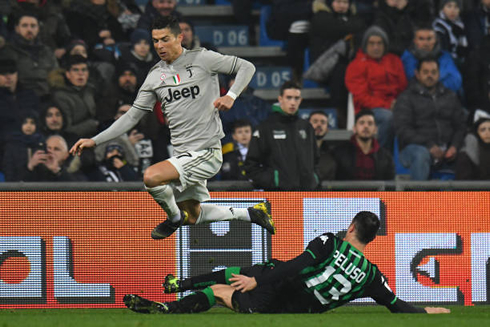 That wasn't the only positive take from this game against Sassuolo though, as Cristiano Ronaldo added another goal to his tally and assisted Emre Can for another. The former Real Madrid superstar was also involved in his team's first goal, since it was his shot that bounced to Khedira before the German midfielder tapped it in for his second goal of the season. It was Juventus 20th win in the Serie A this season, one that had a special meaning since the Bianconeri were coming off two negative results against Atalanta (cup game) and Parma. Led by a revigorated Ronaldo, the champions showed some improvements on the pitch and Massimiliano Allegri will be happy to return home knowing that his pupils managed to sort some of the problems at the back that have been taunting them over the past couple of weeks. Cristiano Ronaldo was everywhere tonight and it's no surprise that he got involved in every single goal from his side. The Portuguese forward managed to score his 20th goal for Juventus since he moved to Italy last summer and his 18th in this Serie A's campaign. He's the competition's top scorer at the moment, with a couple more goals than Quagliarella from Sampdoria and Duván Zapata from Atalanta. The opener arrived in the 23rd minute, when Cristiano Ronaldo intercepted a bad clearance, chested it down do Pjanic and then collected the ball back a few meters ahead in a better position to strike. His shot was strong and directed straight to the goalkeeper, who only managed to block it with his arms and allowed Khedira to follow up on the rebound to make it 1-0 to Juventus. The second goal of the night was born from a corner kick taken by Miralem Pjanic in the 70th minute of the game. 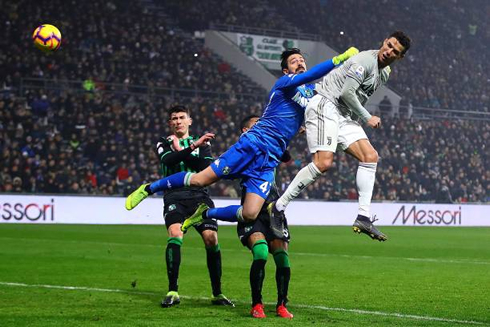 The Bosnian midfielder sent a great cross to the hear of the box and who else but Cristiano Ronaldo rose to the second floor to head it past Consigli and make it two for Juventus. 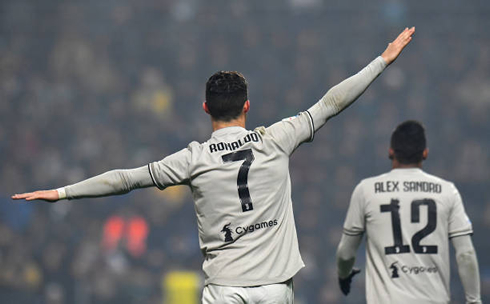 It was Ronaldo's 4th goal from a header this season and his 5th in the 2019 calendar year. Lastly and when we were already inside the last 5 minutes of the game, Juventus sealed the deal in great attacking combination that involved Dybala, Cristiano Ronaldo and Emre Can. The first two managed to quickly switch the attacking side from the right to the left with some quick passing and running, which eventually made room for Can to explore and beat Sassuolo's goalkeeper for the third time on the night. Now onto Frosinone next Friday! Cristiano Ronaldo next game for Juventus is on February 15 of 2019 against Frosinone. You can watch Juventus vs Frosinone, Ajax vs Real Madrid, Celtic vs Valencia, Manchester United vs PSG, Wolverhampton vs Newcastle, and Fenerbahce vs Zenit, all matches provided from our soccer live game pages.